Onboarding workers and processing payroll can often be a tedious task. Drafting locally compliant Employment contracts, never mind determining employee wages, updating vacation and sick pay, withholding taxes and deducting employee-contributed payments for benefits can prove challenging and highly time-consuming. For these reasons, many businesses outsource their employment and payroll services to Africa HR Solutions. In general, using an outsourced service can save you time, money and resources without the need to have a registered entity. It may reduce the cost of processing all the payroll functions in-house. It’s a service that can significantly free up valuable time and simplify your business processing. 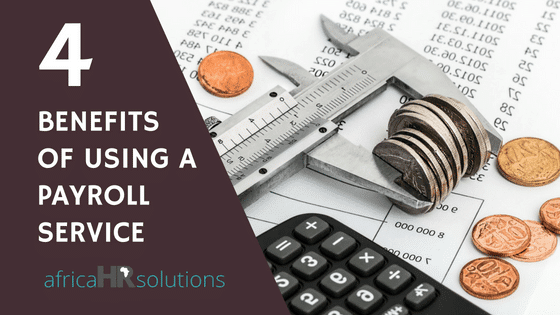 In this article, we look at the 4 major benefits of using a payroll service company like Africa HR Solutions. It is the easiest and fastest way to hire an employee in a new country, while there is no requirement to set up a physical company. This way it allows the client to test the new market without significant investment. Eliminates costs of initial hardware or software investment. Furthermore, it allows tax calculations to be done with total compliance. Errors and manual handling of data is decreased as well as reducing time and spent on administrative tasks. It ensures full compliance for any employee working across Africa while being managed remotely. There is less risks involved employment outsourcing. There are high costs and risks associated with opening your own company. Clients can ensure compliance while legally doing business in Africa through an accredited and recognized umbrella services company like Africa HR solutions. Multi-dimensional functions of this new HR trend has also led to optimization of human resources in terms of Global Mobility. Payroll, tax compliance and social service benefits are taken care of, allowing you to focus on your core business. Not all PEO & payroll providers offer the same level of service. This is especially true when it comes to payroll services on the African continent as different countries have different legislations. Here are some specific traits one should look for from a PEO & payroll provider. A proper payroll service provider will have an established track record. This also reflects that the company has dealt with different payroll situations and requirements. Being able to get in touch with a dedicated support or account manager is essential. Look for a service provider that helps you whenever you need it. Look for a company that provides you with competitive prices for the services you require. Additionally, you also need to determine if a contract is required and all fees involved. Different businesses have different needs. Ensure you choose a payroll & PEO provider that can accommodate your requirements and needs are met. Whether a business needs Employment Outsourcing or payroll services ultimately depends on many factors. In most cases, operating a business in Africa comes with a number of challenges and many business owners often find it rough to manage their HR functions. Using a PEO or payroll service provider will drastically increase your business productivity since it will enable you to save on key resources. Africa HR Solutions has been providing complete HR outsourcing services to businesses operating on the African continent for the past decade. Get in touch today and request for a free, tailor-made quote according to your needs.